After making several quilts that either go on the couch or bed, hang on the wall, or decorate some area of the house, do you ever feel like a little garment sewing? 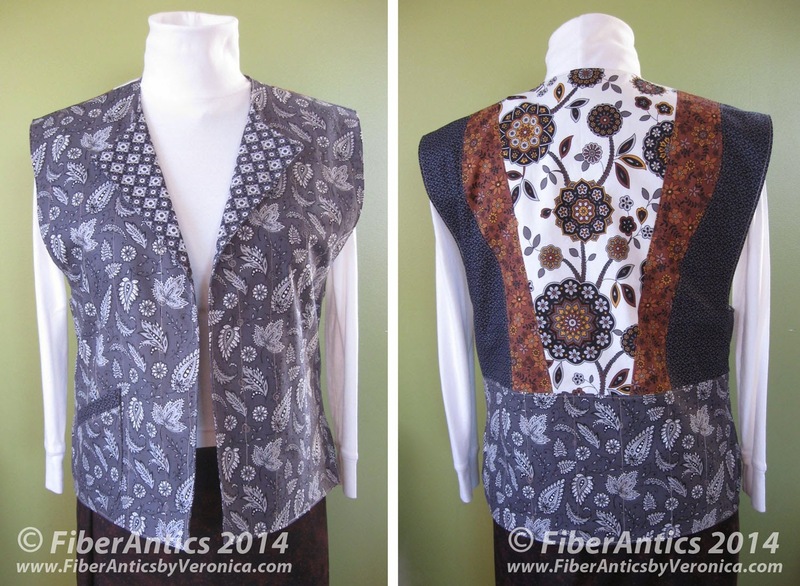 The "Picture This" vest pattern [one of my all-time favorites!] by folk artist, Rachel Clark, offers a blank canvas for patchwork, innovative piecing, or just showing off a beautiful or interesting piece or collection of fabrics. 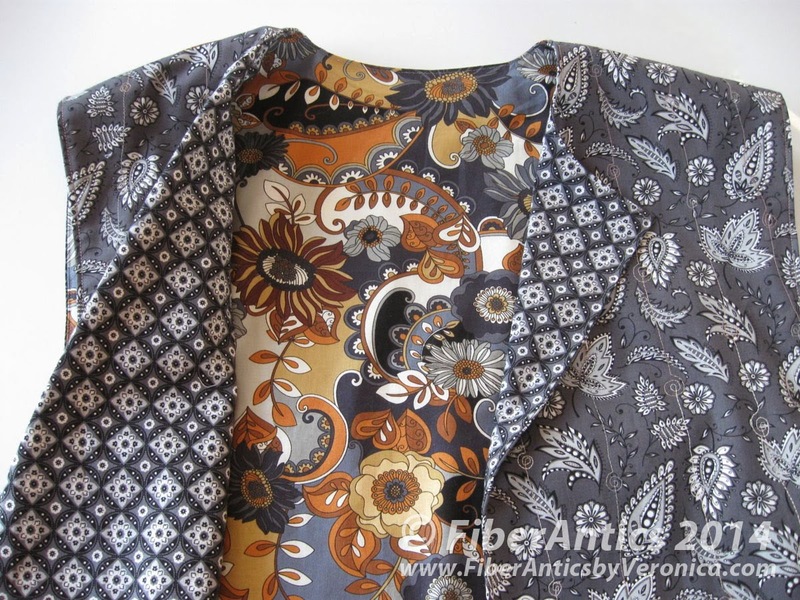 A recent creation of mine uses the Picture This vest pattern and a new fabric collection from Blank Quilting called Mystique. 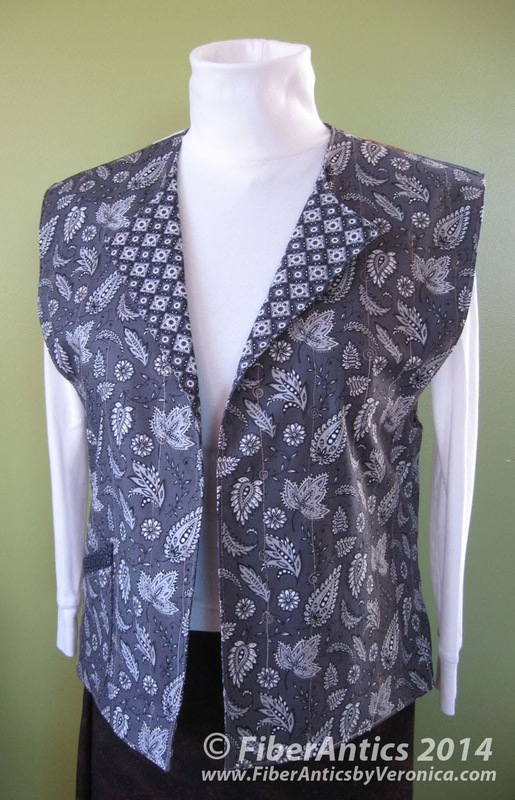 This collection has a few gray and white coordinates (see the vest front) and a couple prints that introduce black and a warm cocoa brown to the mix (see vest back). I particularly like the juxtaposition of the geometric print on the lapels with the leaf and paisley print of the bodice. 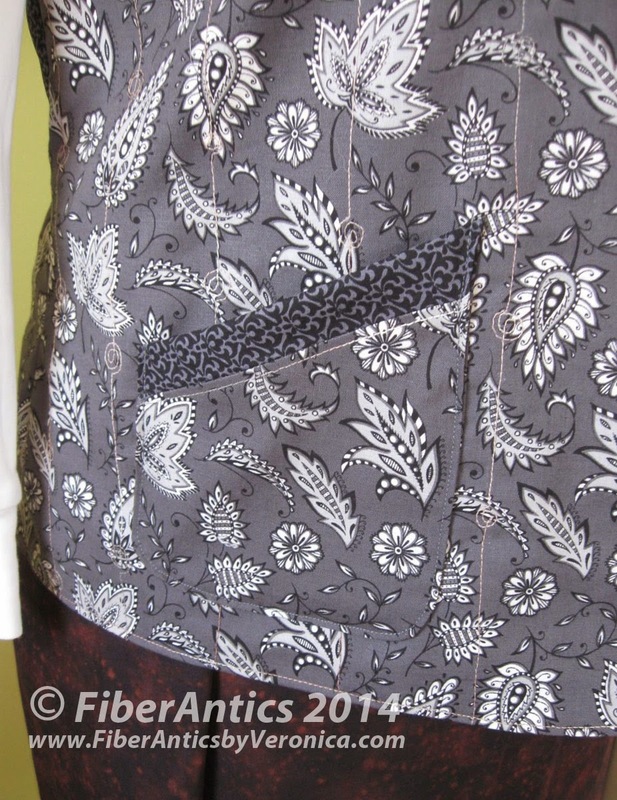 The patch pocket (my own addition) is trimmed with a small black print (6807 from Blank Quilting's Lola collection) that is also featured on the vest back. Patch pocket on front of vest. Although there are only two layers—a muslin inner layer and the pieced top layer—the vest is "quilted." I free-motion stitched vertical lines through the two layers of the vest front and top-stitched along the curved seamlines on the back and on the pocket. The extended shoulders of this pattern provide a figure-flattering inverted triangle shape and the lower hemline is slightly cupped and hugs the hipline. We all like to look as if our waist is smaller than our hips and bustline! Can you say, "hourglass figure?" "Picture This" vest, front and back views. The lining fabric (also from the Lola collection) echoes the gray/brown/black color scheme of Mystique. 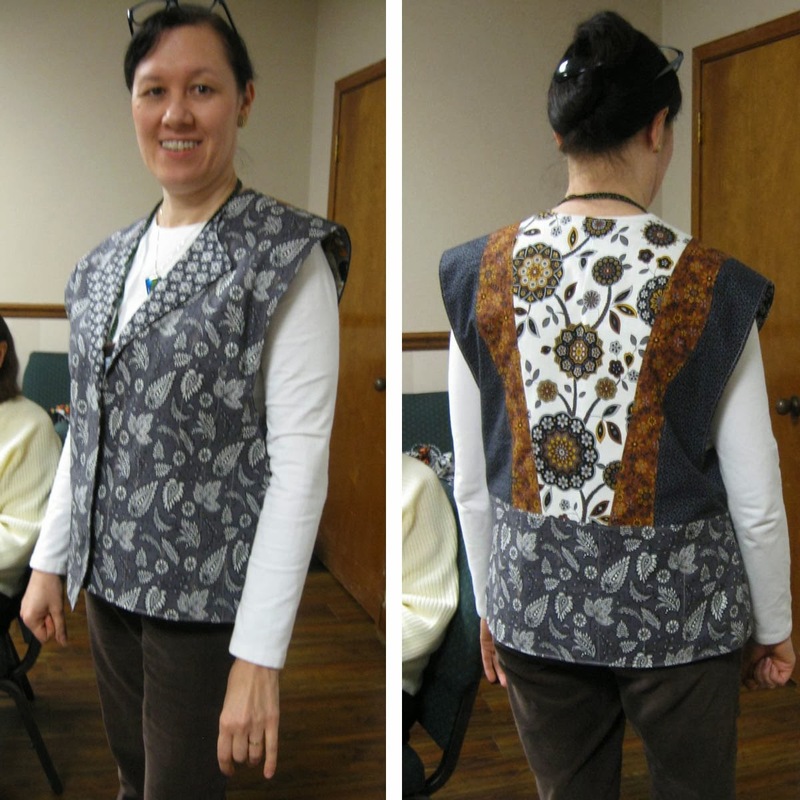 I wore my new vest last weekend while teaching classes at Huntsville Sew and Vac in Huntsville, AL and to the Choo Choo Quilters guild meeting this week. The "Picture This" vest pattern will be available for purchase at Huntsville Sew and Vac (Huntsville, AL) and locally at Ready Set Sew in Chattanooga, TN. "Picture This" vest made by Veronica. And, here is my friend and fellow guild member, Cristy, with a surface embellished top made from a patchwork of kimono pieces. 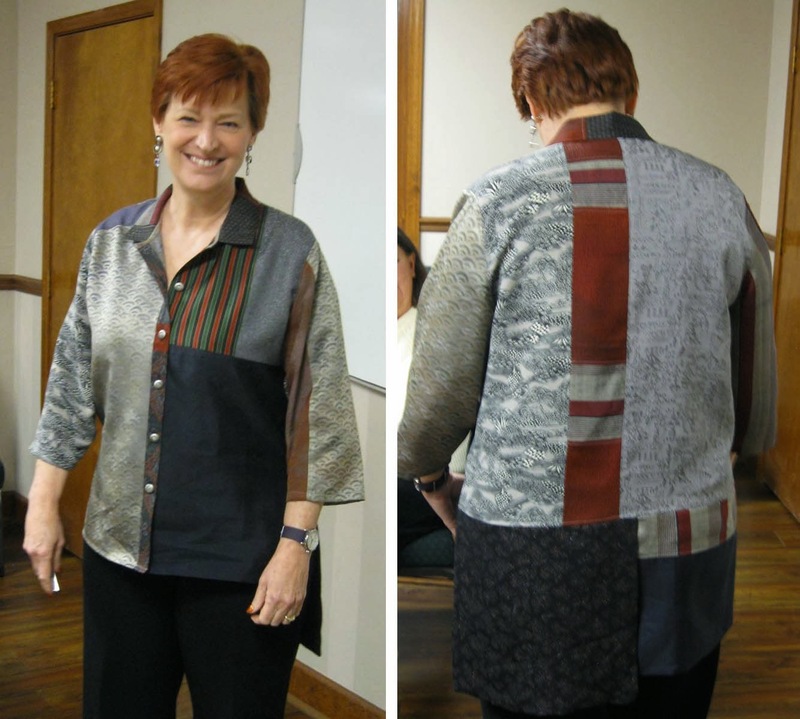 Another idea for "wearing your patchwork!"